Here we stand and here we fall! 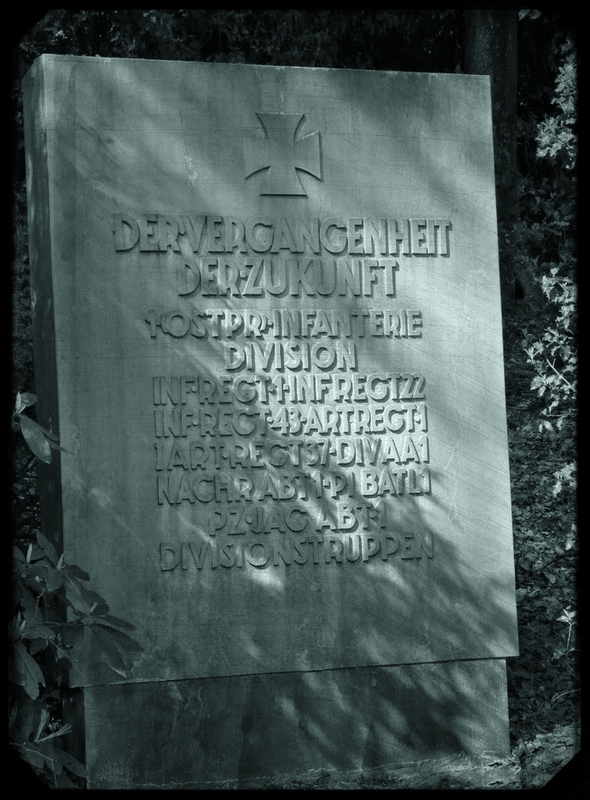 For the last 10 years I have been researching the history of germany’s 1st Infanterie-Division in World War 2. My grandfather served in one of its regiments (Infanterie-Regiment 22, later Fusilier-Regiment 22) from 1941 to 1943. My ultimate goal is to write a history of the Division as seen and told by its soldiers. In the past years I was able to collect a large amount of personal recollections, photographs, documents (incl. the Divisions war diaries) and had the honor to meet many of its former soldiers, of which many were so kind as to allow me to scan their photographs and documents. To finish my project I am still looking for more material. If you are a militaria dealer or a collector owning items (Documents, photographs etc) relating to the Divisions units (*see list below) or if you have/had a relative that served in the Divisions ranks, I would love to hear from you. I do not need the originals, a good scan of anything you might have will be fine. All donors will be mentioned. If you have any information at all on the subject please send me a message via my contact page. Originally formed as the beginning of Germany’s first wave of rearmament, the division was first given the title of Artillerieführer I and only later called Wehrgauleitung Königsberg. These names were an effort to cover Germany’s expansion of infantry divisions from seven to twenty-one. The division’s infantry regiments were built up from the 1. (Preussisches) Infanterie-Regiment of the 1.Division of the Reichswehr and originally consisted of recruits from East Prussia. The unit’s Prussian heritage is represented by the Hohenzollern coat of arms that served as the divisional insignia. Upon the official revelation of the Wehrmacht in October 1935, the unit received its title of1.Infanterie-Division. In February 1936, the headquarters of the division was moved from Insterburg to Königsberg. With the German invasion of Poland in September 1939, the 1st Infantry Division advanced toward Warsaw as a component of the XXVI Army Corps in von Küchler’s 3rd Army. It engaged Polish forces near the heavily-defended town of Mława for several days, took the Fortress of Gora-Kamiensk by storm and then crossed over the Bug and Narew Rivers. It fought again near Węgrów and Garwolin and ended the campaign east of Warsaw. Playing a minor role in the invasion of France (in which Prince William of Prussia, an acting Lieutenant in Infanterie-Regiment 1, was killed in action), the division returned to East Prussia in the autumn of 1940. With the launch of Operation Barbarossa, the 1st Infantry Division entered the Soviet Union as part of the 18th Army with Army Group North, advancing on Leningrad soon earning the nickname of “Bloodhounds of Peterhof”. It remained and fought in the area of Leningrad and Lake Ladoga through December 1943. Transferred to the 1st Panzer Army, the division fought at Krivoy Rog and broke out of encirclement in March 1944. The 1st Infantry Division returned to its native East Prussia for the last time in the summer of 1944. Except for participating in the urgent and temporary link-up with the now-isolated Army Group North in Lithuania (Operation Doppelkopf), the unit remained to defend the easternmost German province from the advancing Red Army. Alternating between 3rd Panzer and 4th Armies, the division was trapped in the Königsberg/Samland area after it was cut off from the rest of Germany by the end of January, 1945. At 0400 hours on February 19, 1945, elements of the 1st Infantry, led by a captured Soviet T-34 tank, spearheaded a westward offensive from Königsberg intended to link with General Hans Gollnick’s XXVIII Corps, which held parts of the Samland peninsula, including the vital port of Pillau. Capturing the town of Metgethen, the unit opened the way for the 5th Panzer Division to join with Gollnick’s forces near the town of Gross Heydekrug the next day. This action re-opened the land route from Königsberg to Pillau, allowing for the evacuation of civilian refugees via the port and solidifying the German defense of the area until April. With the capitulation of Königsberg on April 9, 1945, the surviving elements of the division retreated to Pillau, where this East Prussian unit clung to the last ground of its home province until surrendering to the Soviets. Hello, My great-grandfather, Johann Josef Strobele, lived in both Mengen and Sigmaringen, Baden-Wurttemberg. I presume he served in the 40th Fusilier Regiment (Prince Karl-Anton von Hohenzollern) since it was the closest unit. Am I correct in presuming this? Also, are there any records of this unit that will show his name? Photographs too? Many thanks. it is not guaranteed that your ancestor actually served in this regiment just because it was raised in that area. It might be a possibility, but we will need to see if this was the case. If you also have your grandfathers date of birth I could start a small research project for you. This will include finding out in which unit your grandfather served and a search of the relevant regimental histories, medical/wound records, rolls of honor, medal indexes etc. Everything I can find will be transcribed and translated. Current waiting time for a project like this is about 2 months. Basic price for this package is 85 Euros. If you are interested in my services I will send you an invoice by PayPal. I sent an email earlier and I am not certain it cleared my WordPress account – if it did, great, and if not – my repeat query. I am a writer and creative works director based in Ontario, Canada. I am leading a remarkable project, where we are editing an unpublished memoir manuscript written by member of the Royal Newfoundland Regiment largely wiped out at Beaumont Hamel. Your website accounts convey this battle wonderfully from the German regiment perspective.